Do You Struggle with the Juggle of Time? Frankly, sometimes I think I am the Master Juggler. I am usually able to maneuver my schedule skillfully to satisfy both my personal and professional life. In fact, most of the time, my life feels like one giant balancing act. But in the event when one tiny piece of my day runs late or goes askew (sometimes my bad, other times beyond my control), it throws my whole day off. Every segment of time spills into the next. There’s a glitch in my perfect plan. I have two choices; I can attempt to chase time, which is always fruitless, or I can modify my day and regulate my time-management. This forces me to look at my day more astutely, evaluate the priorities, and make the necessary adjustments. So I work around the non-negotiable tasks, drop one or two errands, and switch the less time-sensitive commitments to another day. Juggling is definitely a skill that only few can master, and yet we all probably attempt this every single day. We struggle with the juggle because of two absolutes; life happens, and time does not stand still. If only we could press pause, like on our DVR, we could catch up. Dream on. We cannot simply press a button. We are not magicians. Our only coping tool is to take an actual pause; evaluate and prioritizeour daily to-do’s. It’s an unremitting job. For sure, this is a daily challenge for me. I wonder if I am in good company. 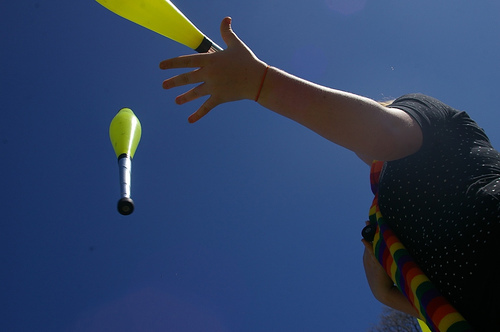 How good of a time-juggler are you?